It’s always a delight to come across another researcher interested in the Heenan surname. Walt Heenan has been trying to break through a brick wall with his family line which involves a family who settled in New York in the early 1800s. There may be a connection to Cavan in Ireland. His story of researches in the New York City directories and Catholic parish registers. It appeared first on his blog Ballincurry Memories but Walt has kindly agreed I can re-post his tale here. If you know any information which can help him make further progress with his family, do leave a comment on his post via this link . I have been trying to break through a brick wall for many months (or has it been years). I tracked my Heenan line back to William born 1831-1834 in New York City and Mary Ann Reilly born 1836 in Ireland, and there I got stuck. Serendipitously, just after Christmas 2018, I was sitting in a Starbucks in Sarasota Florida with my laptop when I happened on a Facebook post from a genealogy group I follow. The person mentioned New York City directories being online at the NY Public Library. Between sips of my mocha latte, with nothing more pressing to do, I took a half-hearted stab at seeing if I could locate some early Heenans. I reasoned since my GGGF William was born in the early thirties, perhaps there were Heenans in NYC in the early twenties. I brought up the 1920 directory, and viola, there was one Heenan – Philip. Now that was interesting since William’s son, my GGF, was also Philip. Hmm, could be nothing, but at least it wasn’t a James, or Patrick, or Michael! I spent a bunch of hours searching all the directories from the 1780s until 1886 for any Heenans. Philip was the first and only to appear for the first ten years, and his first entry was 1820. I guess I got lucky. Now that I had a possible father’s name for William I began digging…well more like foraging for anything related to Heenans, particularly Philip, in the first two decades of the 1800s. I eventually did a search for Philip Heenan of that time period on the site findmypast.com. There were two records. Both were transcriptions of Catholic Church parish marriage registers. I opened the first with a rising sense of excitement. It was the marriage of Philip Heenan to Mary Ann Neil in 1831 in St Patrick Old Cathedral. Nothing firm, but pretty interesting. 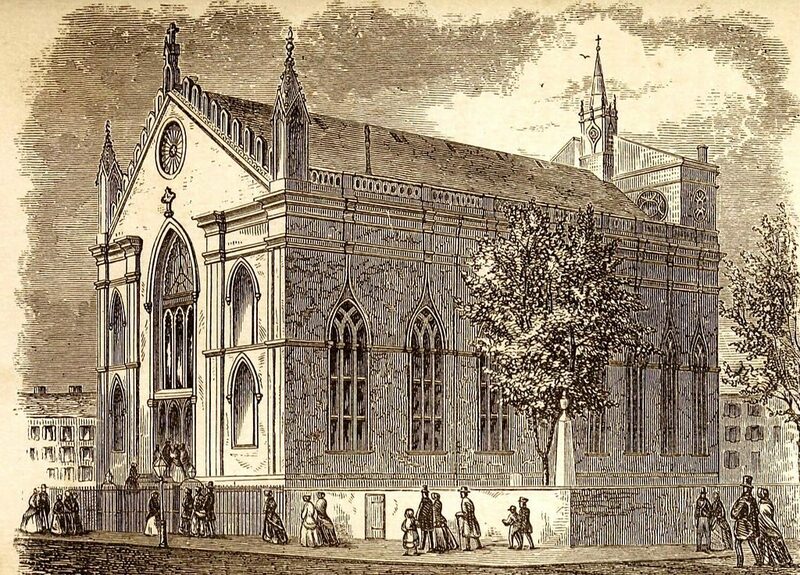 As an aside, dedicated on May 14, 1815, St Patrick Old Cathedral was one of the first Roman Catholic churches in New York City. John Connolly, an Irish Dominican friar, became the city’s first resident bishop. It became the spiritual home for many of the city’s burgeoning Irish immigrant population. It was the terminating point of the annual St. Patrick’s Day parade. In 1836, it was the subject of an attack after tensions between the Irish Catholic population and the anti-immigrant, anti-Catholic, nativist “no-nothing” movement boiled over into riots. The Ancient Order of Hibernians established its headquarters across the street from the church cementing its importance to the nascent Irish community. I knew Philip’s son William was married to Mary Ann Reilly in New York City, and I knew they were likely married around 1856 or shortly before as they started having children every few years starting in 1857. Could I be this lucky? I tenuously typed William’s name into the findmypast search boxes and hit enter. There were eight results with the fourth one being William Robert Heenan married 1856. Steeling myself for the inevitable disappointment, I selected the record. Goldmine! William Robert Heenan (I already knew him as William R Heenan) married Mary Ann Reilly 27 Apr 1856 in St Alphonsus church. But unlike Philip’s marriage register, this one provided parent’s names…both sets! I now had Philip Heenan and Mary Ann O’Neil as well as Michael Reilly and Catharin Brady. The record also provided Mary Ann’s residence as “Cavin” which I assume is Cavan, Ireland. I now had a full new generation as well as the marriage register entry for one of the sets of parents. Talk about getting lucky. I am feeling pretty confident that Philip Heenan and Mary Ann O’Neil are my GGGF William’s parents, and therefore my GGGGparents. But interestingly, I have come to believe that the Philip that started me on this quest is not my GGGGF. The directories that led me to Philip had some things that never completely added up to him being William’s father. Philip first appeared in the directories in 1820. He then appeared in every directory from 1823 through 1828 and then disappeared. In 1832, there was a Sarah Heenan listed as widow of Philip. Another anomaly was that in 1829, there was a John Heenan listed in the directory. John’s addresses for both work and home were the same addresses as Philip. Also, in 1830, there was a Heenan, widow of John. And in 1831, a Sarah Heenan, widow of John. I guess anything’s possible, but it seems likely that this Philip died sometime between 1828 and 1832 and was married to a Sarah. While our Philip was married in 1831 to Mary Ann O’Neil. But the first Philip sent me on the path to eventually find mine. I guess it’s true, sometimes it’s better to be lucky than to be good. I am not sure who the first Philip is. Perhaps he is the father or uncle of my Philip, but I tip my hat, and a pint of Guinness to him.